The following figure illustrates the major components of WCF. 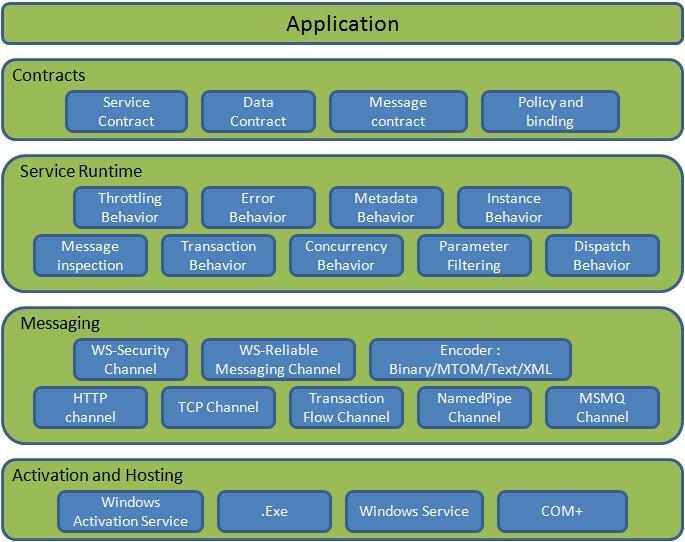 Contracts layer are next to that of Application layer. Developer will directly use this contract to develop the service. We are also going to do the same now. Let us see briefly what these contracts will do for us and we will also know that WCF is working on message system. - Describe about the operation that service can provide. Example, Service provided to know the temperature of the city based on the zip code, this service we call as Service contract. It will be created using Service and Operational Contract attribute. - It describes the custom data type which is exposed to the client. This defines the data types, are passed to and from service. Data types like int, string are identified by the client because it is already mention in XML schema definition language document, but custom created class or datatype cannot be identified by the client e.g. Employee data type. By using DataContract we can make client aware that we are using Employee data type for returning or passing parameter to the method. - Default SOAP message format is provided by the WCF runtime for communication between Client and service. If it is not meeting your requirements then we can create our own message format. This can be achieved by using Message Contract attribute. - Specify conditions required to communicate with a service e.g security requirement to communicate with service, protocol and encoding used for binding. - It contains the behaviors that occur during runtime of service. Throttling Behavior- Controls how many messages are processed. Error Behavior - Specifies what occurs, when internal error occurs on the service. Metadata Behavior - Tells how and whether metadata is available to outside world. Instance Behavior - Specifies how many instance of the service has to be created while running. Transaction Behavior - Enables the rollback of transacted operations if a failure occurs. Dispatch Behavior - Controls how a message is processed by the WCF Infrastructure. Handles sending and receiving message from network. Protocols like HTTP, TCP, name pipes and MSMQ. Implements SOAP based protocol by processing and possibly modifying message. E.g. WS-Security and WS-Reliability. Internet information Service provides number of advantages if a Service uses Http as protocol. It does not require Host code to activate the service, it automatically activates service code. (WAS) is the new process activation mechanism that ships with IIS 7.0. In addition to HTTP based communication, WCF can also use WAS to provide message-based activation over other protocols, such as TCP and named pipes. WCF service can be self hosted as console application, Win Forms or WPF application with graphical UI. WCF can also be hosted as a Windows Service, so that it is under control of the Service Control Manager (SCM).